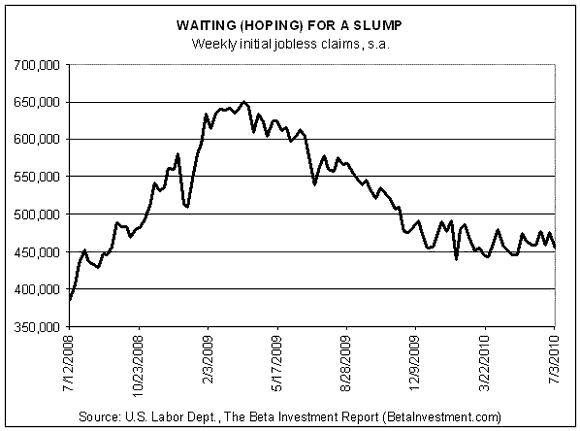 The case for deflation retreated a bit today with this morning’s update of weekly jobless claims. New filings for unemployment benefits slumped by a tidy 21,000 last week to 454,000, the government reported. That’s a tactical victory, but until and if the trend rolls on it’s only marginally encouraging. The strategic outlook, in other words, is still up for grabs. For reasons that need no explanation at this late date, a drop in new jobless claims is as welcome these days as a rainstorm in a desert. But the problem remains: Been there, done that. As the chart below reminds, new filings have been bouncing around in a range all year. A sustained dip below the 450,000 would signal a change for the better. As of last week, new claims are at the lower end of recent history. Salvation, it seems, is just around the corner. But we’ve been hoodwinked before and it’d be foolish to think that the numbers can’t jump higher again. Further complicating the analysis is the anticipated summer shutdowns of auto plants to retool equipment for new models—a glitch that may render jobless claims data unreliable in coming weeks. Meantime, we’ll have to look to other metrics to read the economy’s tea leaves. Next week brings updates on monthly retail sales and consumer price inflation. Unfortunately, the consensus forecast calls for a decline in consumer spending for June and flat prices in headline CPI for the month, according to Briefing.com. The debate about the economy, in short, is still alive and kicking.